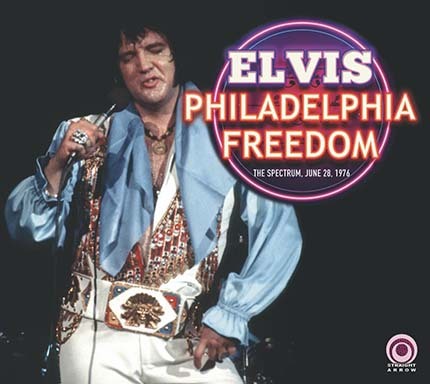 “Philadelphia Freedom”. It's the summer of 1976, and America is celebrating its bicentennial. What could be more patriotic than seeing America’s greatest entertainer in the city where the countries' Declaration of Independence was formed and signed? Straight Arrow team has been looking for a recording of this particular concert for a long time… and finally succeeded. Compared with July and August 1976 concerts, performances in June were of a much better standard and the Philadelphia concert is no exception. Elvis did a fine show that night. The Philadelphia, June 28th, 1976 show is previously unreleased. Until now, this show was not available in acceptable sound. The only existing tape was in horrible quality. Our release has been taken directly from a previously unreleased original audience-recorded cassette. This concert was recorded by an Elvis fan from Pennsylvania. 01. Gonna Fly Now (theme from Rocky - by Joe Guercio & The Hot Hilton Horns) - 02. Black Sunday (by Sweet Inspirations) - 03. If You Leave Me Now (by Sweet Inspirations). 04. Introduction: Also Sprach Zarathustra - 05. C. C. Rider - 06. I Got A Woman / Amen - 07. Love Me - 08. If You Love Me (Let Me Know) - 09. You Gave Me A Mountain - 10. All Shook Up - 11. (Let Me Be Your) Teddy Bear / Don't Be Cruel - 12. And I Love You So - 13. Jailhouse Rock - 14. Fever - 15. America The Beautiful - 16. Introductions of singers, musicians, orchestra - 17. Early Mornin' Rain - 18. What'd I Say - 19. Johnny B. Goode - 20. Drum Solo (Ronnie Tutt, incomplete) - 21. Bass Solo (Blues - Jerry Scheff) - 22. Piano Solo (Tony Brown) - 23. Electric Piano & Clavinet Solo (David Briggs) - 24. Love Letters - 25. School Day - 26. Hurt #1 - 27. Hurt #2 - 28. Hound Dog - 29. Funny How Time Slips Away (with reprise) - 30. Can't Help Falling In Love - 31. Closing Vamp / Announcements.